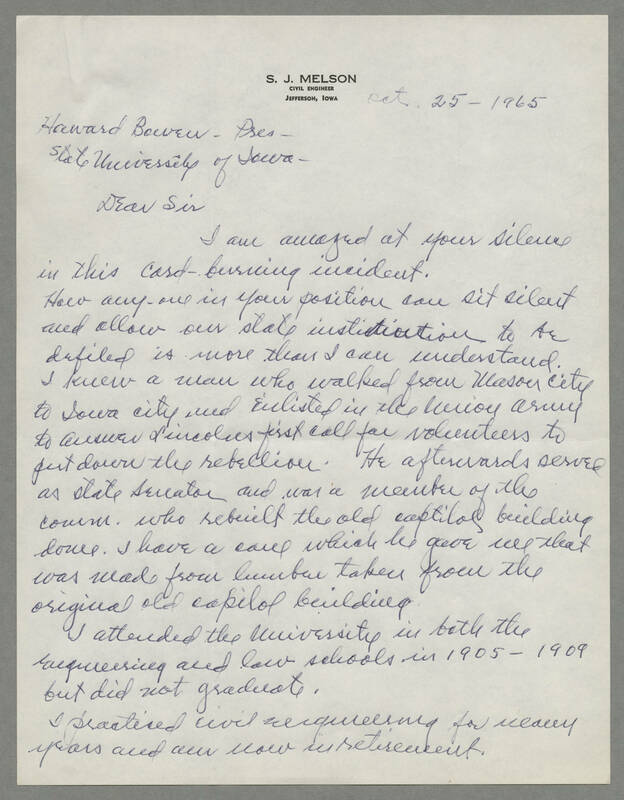 S. J. MELSON CIVIL ENGINEER JEFFERSON, IOWA Oct. 25- 1965 Howard Bowen- Pres- State University of Iowa- Dear Sir I am amazed at your silence in this card-burning incident. How any-one in your position can sit silent and allow our state institution to be defiled is more than I can understand. I knew a men who walked from Mason City to Iowa City and enlisted in the [?] army to answer [?] first call for volunteers to put down the rebellion. He afterwards served as state Senator and was a member of the comm. who rebuilt the old capitol building dome. I have a cane which he gave me that was made from lumber taken from the original old capitol building. I attended the University in both the Engineering and law schools in 1905-1909 but did not graduate. I practised civil engineering for many years and am now in retirement.